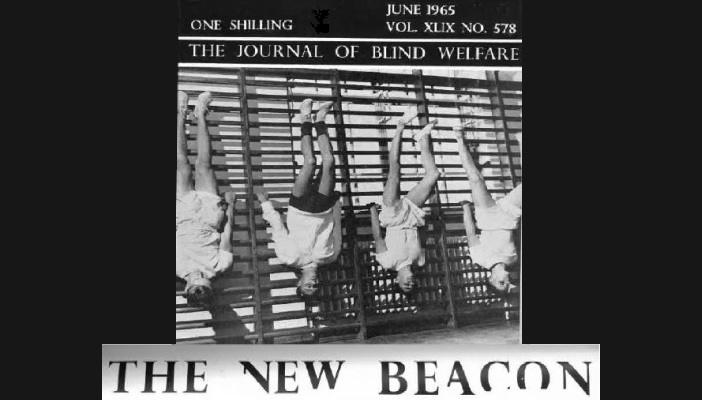 Between May and July 1965, New Beacon featured Dr Don Liddle’s paper 'Mobility: A Survey', providing an insight into the problems of mobility from people with sight loss themselves. One hundred of the most detailed replies from ‘blind travellers’ reveal how views and experiences of blind and partially sighted people in the UK have changed over the last half a century. And perhaps surprisingly, what has stayed the same. Do you carry stick, and if so how do you use it? Ninety-eight of the 100 do carry a stick. The 16 who mainly carry their stick, as opposed to using it, tend to have a little vision or to be youngish early blind subjects. Many blind people have a strong feeling against tapping, on the grounds that it is “very blind”. I heard somewhere recently of a blind man with a stick which had at its foot a small rubber wheel, so that it could be propelled quietly along the pavement ahead. It is not a new thought, but it is one which this whole survey points up again, that mobility, for most of us who cannot see, involves a compromise between an ideal use of our remaining abilities and the appearance we are prepared to present to the general public – and, to some extent, to our fellow-blind. Which do you prefer to be walking alongside: fence, wall, railings or hedge? “Hedges are often unkempt, overhanging the pavement and presenting thorns to scratch the face or twigs to poke the eye; after wet weather they are loaded with rain, to be deposited in the face and down the neck of the unfortunate traveller. One can also get the stick caught up in a hedge." If you are ever out alone, without a stick, how do you get on? Approximately half are never travelling without a stick. Forty-three “never subject [them]self to such an experience”. Whether one ever goes out without a stick, and how well one fares, appears to be linked with age at blindness, the early blind managing rather better. Absence of the stick is associated with unpleasant feelings, particularly loss of confidence. The use of a stick appears, one might say, to be “habit forming”, so that those who formerly managed without would now feel decided discomfort. I would suggest that, having later adopted a stick, most of us have found this a relief, and our travelling that bit easier and safer. It may be that each new mishap leaves its dint on one’s confidence, as well as one’s carcase, so that one is more prepared to use a stick later on. What sort of places do you find awkward to negotiate? Open spaces are the most trying to negotiate, followed by noisy or crowded places. Railway stations, shopping centres and downward flights of steps are particularly unpleasant. The early blind particularly, have a dislike of excessive noise. "Stations: noisy, open, no guidance, there is the fear of walking off the platform (particularly with electrified lines), or down the many flights of steps; some obstacles, such as seats and pillars supporting the roof, are always in the same places – not that one gets the chance to learn their situation very well – but others, such as trolleys and piles of luggage, can crop up in all sorts of places; often, of course, stations are also crowded." Would you say that you get all the help you want in getting about? Only 15 people feel that they do not always get all the help they need in their travels. There are constant references to being “lifted” on or off buses, being virtually “carried” along a road, and being “manhandled in a manner which is dangerous, uncomfortable and undignified”. Such “faults”, for lack of a better word, arise, it is universally agreed, through lack of understanding. Most of the sample make a point of accepting even unnecessary help for the sake of later blind people. Amongst the common obstacles to be met with outdoors, which do you find to be the greatest menace? The most-mentioned obstacles are bicycles, roadworks, posts, prams and children’s toys. Three features are pre-eminent: obstacles which are not permanent, but which may or may not be in a given spot; things too “thin” or too low to be heard; holes, steps and so on, which might cause a fall and which are particularly difficult to detect by stick or hearing. “There are only very few people who find difficulty with vehicles partly parked on the pavement; most people can detect such large objects, but a bicycle or pram is a different story." Blind people are often supposed to have keener sense of hearing and touch than the average sighted person. Do you to feel this is true? Forty-three feel that both their hearing and touch are more developed than the average sighted person’s: 33 do not. There is a stronger tendency to feel that touch is improved than to feel that this is true of hearing. But this is not to think in terms of some natural compensation, the automatic sharpening of the remaining senses with the loss of sight. Enjoyed this article? Why not read On this day... April 1972 and read about how cornea donations were flown to Commonwealth countries for eye operations. Or read On this day... March 1985 to read how rehab officer with VI, Rod Wilson, didn’t feel people with VI were taken seriously enough in the profession.